Bali is a place that has, for over a century, inspired people from around the world to come to be 'elsewhere' and yet, feel at home. Beauty of landscape, extraordinary culture, warm welcome – Bali has it all, and more. By its very difference, it symbolizes the essence of archipelagic Indonesia – cultural diversity and syncretism. As a Muslim majority country of 240 million inhabitants, Indonesia is proud to host a Hindu population in its midst that is, in turn, proud of its national bonds. Bali, by being 'Bali', proclaims Indonesia's openness and multiculturalism to the world. As such, Bali has also played a seminal role in inspiring Indonesians to creatively express the astonishing variety of identities that shape their vast nation, and at the same time affirm their harmonious identity as one nation. Bali Inspires approaches this special relationship between Bali and the rest of Indonesia through the perspective of the visual arts. 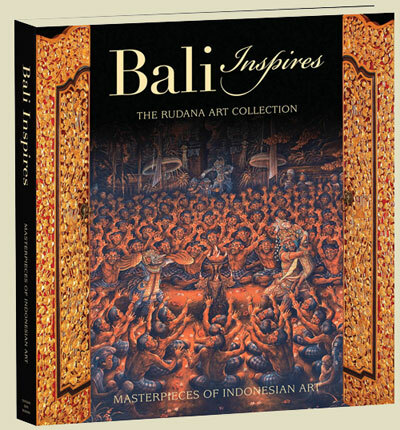 The astute text, by writer and art connoisseur Jean Couteau, first provides a historical overview of Bali's heritage and the artistic renewal that took place there in the early 20th century. It then explores how modern art first appeared in Indonesia as a reaction against the 'Orientalism' of colonial art. We learn how the masters of Indonesian modern art absorbed Western techniques and styles, yet managed to retain the hallmarks of 'Indonesian-ness' in their work, and how images of Bali contributed to this process. In parallel, we gain insight into the resilience of Hindu symbolism in Balinese modern art. The vantage through which this art is presented is that of the Rudanas, a Balinese family who have dedicated themselves to its collection. The text is richly illustrated by works from Museum Rudana, the Rudana Fine Art Gallery, and the Rudanas' private collections, with explanatory captions to enhance readers' understanding of the works' meanings.